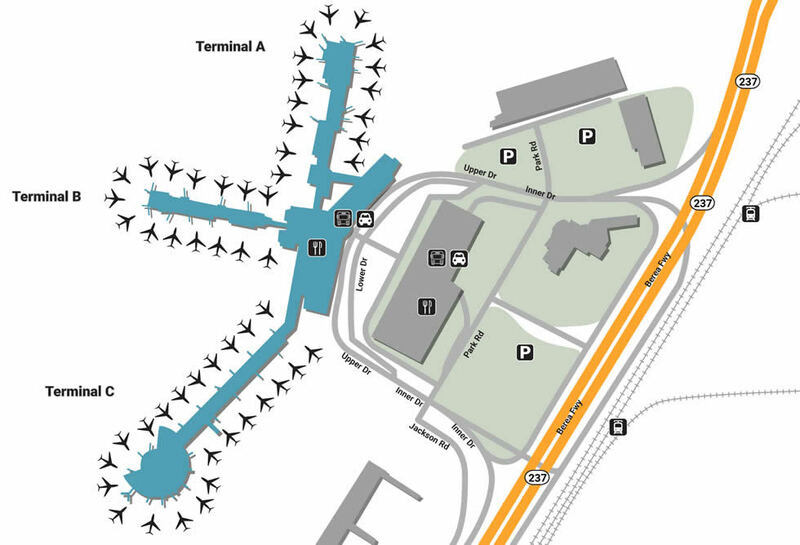 Tourists arriving at Cleveland Hopkins International Airport can find their way around the terminals and get to their destination with a quick overview of the area. Looking out on the shores of Lake Erie, Cleveland is home to the Cavaliers as well as a flood of friendly people, each one as eager as the last to help. This is especially true for the staff at Cleveland Hopkins International Airport. Though the facility is relatively far from downtown, the airport’s wide variety of restaurants and shops is sure to pep your step. See all there is to see by making sure your vehicle is taken care of. The closest parking is located in the CLE Smart Garage, which offers low-cost hourly parking. For a cheaper daily rate, head to The Red Lot, located across from the Sheraton Hotel, or go even cheaper by dropping off at The Blue Lot next-door. Connected to the garage is the Orange Lot, which offers the second-lowest daily rate. Long-term travelers looking for the most bang for their buck should head to the Brown Lot, located at 4960 Rocky River Drive. Offering 24-hour assistance as well as concierge services, Curbside Valet is the most convenient option. Give yourself the gift of convenience by asking the help of others, whether it’s through the resourceful tips at The Information Desk near Main Terminal Ticketing or the helpful hands of Currency Exchange, located either across from Concourse C’s Security or Baggage Claim. Have a moment to yourself by visiting the Interfaith Chapel, located before Concourse B’s Security. Make sure your pets are also relaxed by taking them to the Pet Relief Area at the north end of baggage claim, closest to Carousel 1. CLE Airport also offers two beautiful conference rooms, each one fully equipped with the latest technologies and on-site catering. Allow relaxation to seep over by not allowing stressful delays to get the better of you. Support thrifty local merchants as you take a tour of the facility, picking up the latest graphic designs at Fresh Brewed Tees (Gate C2) or getting a specialty gift at Inca Teas (B4). If you’re a man in need of a dashing look on the dash, visit Johnston & Murphy, located in the Main Terminal, for fresh blazers and interesting earth tones. Women looking to transform their look should head to Monarch (Concourse C entrance), an eclectic boutique with universal appeal. Rest assured that everything on the other side of your departure will be fine by staying full before you leave. Mix something fresh together at Green Leaf’s Beyond Great Salads (C16), a salad bar that packs a nutritional punch. Catch the game and grab a bite to eat right in the knick of time by heading to either location of Winners Sports Bar & Grill (C24, A6). If you’re in the mood for something fresh but filling, eat a hearty delicacy at Currito: Burritos Without Borders, located in the Main Terminal alongside breakfast giants, Bruegger's Bagels.